Last issue I commented on the fact that Tim Seeley wasn’t writing the second part of the arc he just started. Little did I know that issue 50 would be something different entirely. If you guessed that this issue would deal the ramifications of Hal Jordan & The Green Lantern Corps #50, then I need to ask you who’s going to win the World Series this year. If this issue happens to be your first issue, then you might be a bit confused, but since this issue was mostly set up it’s okay to be a bit confused. Yes most comic book story lines tend to end with a relatively happy ending for our protagonists, but this issue kills any tension that the previous two issues had. That’s nothing against Dan Jurgerns, but rather a issue with how DC’s publishing schedule handled this. Normally I don’t let aspects like this affect my enjoyment of a comic, in this instance it did. Dan Jurgens is a veteran, he understands how a good comic needs to work in order to capture a readers attention. One of the aspects that I loved, was the ominous tone that is felt throughout the issue. While Green Lanterns is a series has had it shares of dark moments, the tone in GLS 50 felt completely different than what long term readers might expect. 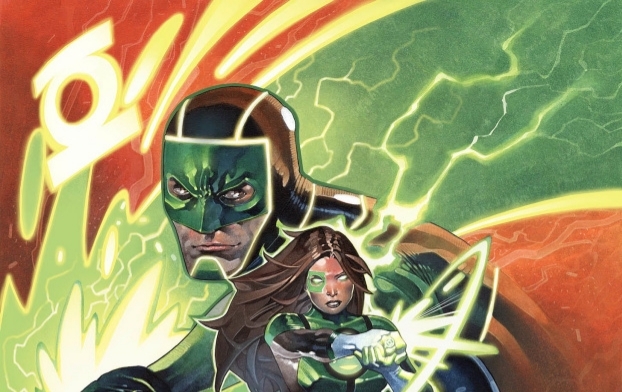 For most of this issue, the Green Lanterns do retain familiar characterizations that we’ve come to know, much to my surprise even Simon and Jessica retain their all to familiar rapport, but they sadly take a backseat to the whatever story that will eventually happen in Hal Jordan & The Green Lantern Corps #50. As a setup issue, the execution was perfectly fine, but were missing a few pieces of the puzzle that might help readers understand what’s going on. Much to my surprise, Mike Perkins was the penciler for this issue. Given that Jurgens went for a darker tone, Perkin’s pencils is what make is sing. Everything has a slight dark shadow to it, instead of the bright glowing colors, it’s more of a subdued feel to it. Once again I’m not sure how fans of the series will react to this sudden tone and artistic change, but I for one am enjoying the shift. I just wish the switch over wasn’t so abrupt. Not only does Perkin provide extremely great storytelling, I deeply admire the the level of grit that he put into his pages, it makes the world that we as reader are visiting feel lived on. Nothing that looks like a JJ Abrams movie from 2009. The only nitpick that I have against Perkin’s pencils is some of his face in certain panels were either unrecognizable or just really muddled. Otherwise it was pretty cool to see Perkin draw the Green Lantern Corps. Also his Guardians looked a bit taller than they should be depicted, that’s a nitpick honestly.